I've owned probably half a dozen drinking fountains for my cat, Cally. I clean them regularly and change the filters, but eventually the motors die out. I've tried cheaper and expensive models, but after 6 months to a year I have to invest in a new one. 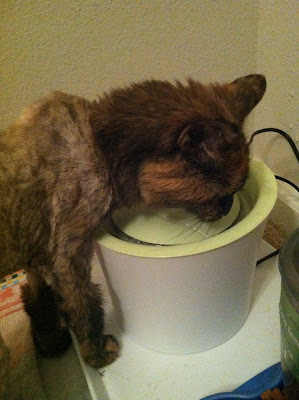 One of the problems I have is that Cally likes to dip her paws in the water, as well as play with her kibble, which results in litter and food in the drinking fountain pool. So this time, when I needed a replacement, I decided to try the Catit Fountain. It was under $20 on Amazon Prime, and I really liked the aesthetic design. I also wanted to see if Cally, who likes to drink from the tub faucet, would like this fountain. The verdict? She loves it! She actually begs less for water from the faucet now. I don't have to refill this very often, and the water filters clear for her. I'll have to clean the reservoir, but at least I know she's not drinking dirty water. It's not any louder or quieter than past fountains I've owned, and Cally makes less of a mess with this one. Now the test will be how long the motor survives!